I’m a linguist. Words fascinate me, and I enjoy digging into their roots to find where they came from. pulled in different directions? dragged apart? oh, how this defines my heart. My heart is dragged in two directions daily; no, in every moment I am awake. There is a deep-rooted struggle within me, at the center of each step I take and every choice I make. Distraction. It is the weapon of my flesh that attempts to drag me in another direction–that is, away from my God. And yet, distraction is subtle. Distraction is not brute force, but rather a tantalizing invitation. wouldn’t you rather do this? for just a few minutes? then you can get back to business. you know, it’ll be good for you. it’s a good thing. worth taking the time for. 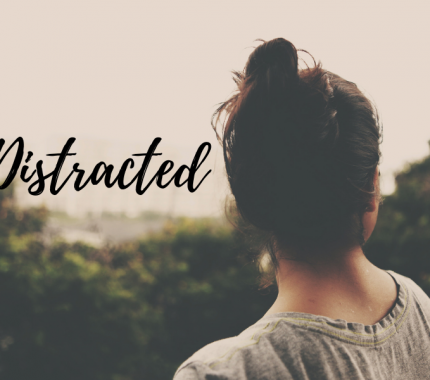 Distraction lures me away to its time-draining snare, where I often don’t notice I’ve been snagged until the clock betrays just how many minutes–or hours, or days–have passed. Then I emerge, bleary-eyed and horrified. Where has my life gone? How did I stray so far from the path? I am called to a single-minded, single-hearted focus. …But one thing I do: forgetting what lies behind and straining forward to what lies ahead, I press on toward the goal for the prize of the upward call of God in Christ Jesus. I have been redeemed. Bought back from the chains of sin and death. I have been given a new life, a new heart, unstained by the terror of evil. And I have been given a new mission: to press on toward the goal. I have been given the ministry of reconciliation (2 Cor. 5:18-20) and the way I am to carry that out is to go and make disciples of all the nations (Matt. 28:18-20). Like a marathon runner, I am on an endurance race, one which lasts the duration of my life here on earth. and yet I go about it all wrong. I am so DISTRACTED. The siren call of the “interesting” and “fun” draws my gaze away from where it ought to be–looking to Jesus, who is on the path ahead. I follow endless rabbit trails that spiral out from the narrow road, often without a thought as to where they lead: a dead end, not the path I have chosen. I fail to exercise discernment between “good” and “best.” I fill my life with so many good things that become urgent, blocks on my calendar that cannot be removed or replaced. I run as one who is hurried and desperate, just trying to keep up as life spirals out of control ahead of me. I cling to my schedule, the thing I think I can control, failing to notice that I’m letting it control me. I put my head down and plow onward, utterly bull-headed. I am so determined to get it all done in my own strength. I insist to everyone around me that these are important things, that they have to take priority because otherwise I’ll be wasting my time. I wear myself out trying to run this marathon as a sprint, weighed down with all of the events and the to-do lists. Then I crash, not having the energy to maintain my stride. When I crash, I lay down my guard. I allow myself to turn off my brain and scroll, procrastinating the next item on the list, wasting the hours away without purpose or care, and depriving myself of the true rest I need. And in all of this, I am distracted. Distracted from my mission and my ministry. Then He said, “Go out, and stand on the mountain before the LORD.” And behold, the LORD passed by, and a great and strong wind tore into the mountains and broke the rocks in pieces before the LORD, but the LORD was not in the wind; and after the wind an earthquake, but the LORD was not in the earthquake; and after the earthquake a fire, but the LORD was not in the fire; and after the fire, a still small voice. why do I forget so easily? I was created for Him. I was created to know His smile, to recognize His voice (the still, small voice), and to intimately know His love. I was not created to dash around frantically, going going going, doing doing doing for Him. I was created for fullness of joy. For ultimate satisfaction. For eternal hope. Instead I center my life around things that I have deemed important. Things that I decided I could “fit in.” Things that I insist are good. and then I wonder why it is I can’t hear His voice. In my state of distraction I fail to notice that I. have. drowned. Him. out. The cry of my heart resonates with that of Paul’s. “I want to know Christ…” Truly, I want to know Him. I want to spend my life knowing Him better each day, and making Him known. To do that, I MUST strive to fight the distraction, in His strength. I must refuse to be torn in two directions. I must seek Him, struggling to soak in absolutely everything from His presence, as if He is the very air that gives me life. I must bow at His feet, pouring out my soul before the throne of grace, where He has promised I will find mercy and help in my time of need. because He knows all of me, better than I know myself, and I can trust Him. I must pursue Him, with my whole heart, casting all my life past, present, and future at His feet. because it’s all His, anyway. I must look to Jesus, as the author and finisher of my faith, and from Him draw my strength, my hope, my joy, and my peace. Then, and only then, can I truly run the race and pursue the prize.